523-9045 - 2" x 3 1/2" Solid, .040" Satin Brass, finished on both sides. Quality materials give you not only a durable product but the professional image you are looking for. Leatherette straps provided. 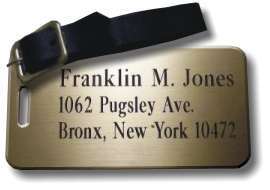 This is a quality Brass luggage tag, please allow 7-10 days for delivery.